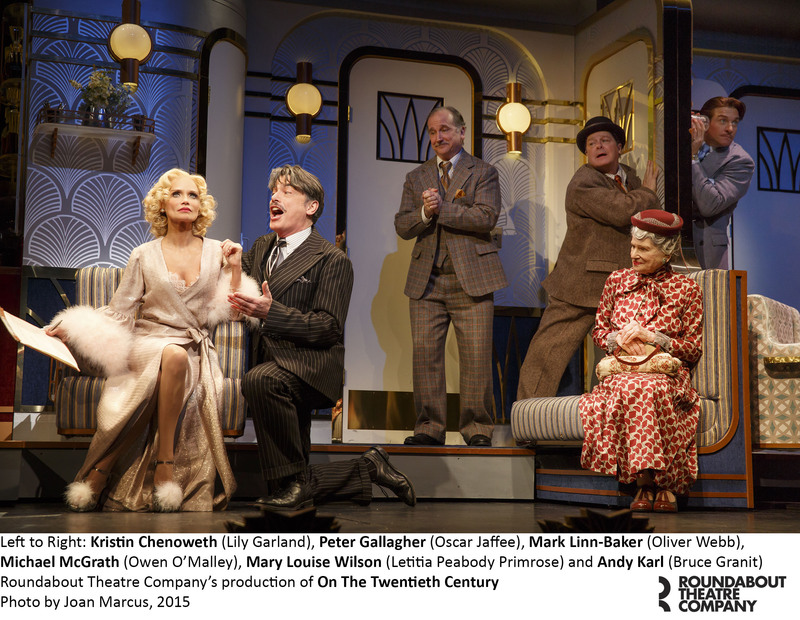 Even when it first opened on Broadway in 1978, On the Twentieth Century already seemed old-fashioned: a backstage musical set in the 1920s featuring elements of farce and screwball comedy, with a bouncy Cy Coleman score and show-within-a-show production numbers evoking the era. And now it’s back on Broadway in a fun and fizzy revival from director Scott Ellis at Roundabout’s American Airlines Theatre on Broadway. 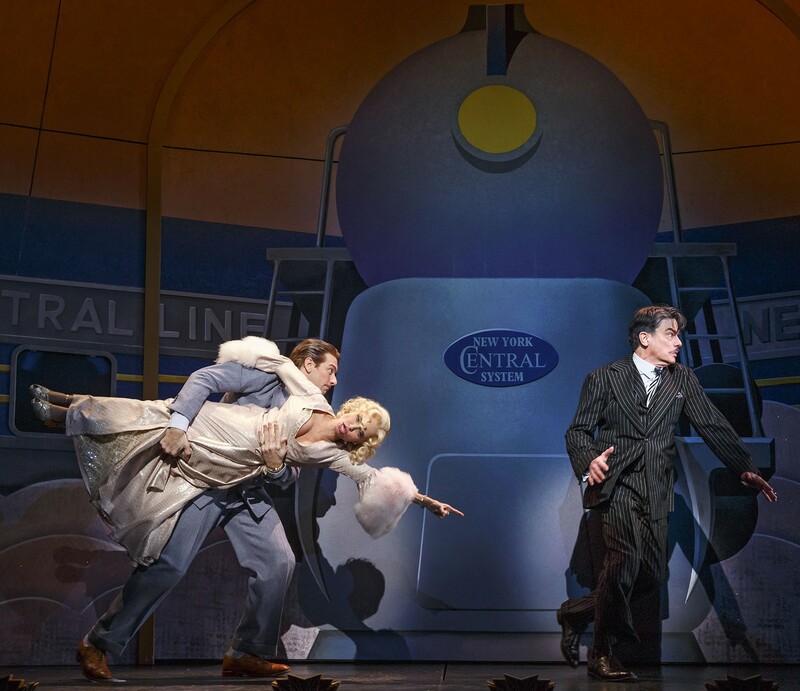 Peter Gallagher exudes leading-man swagger as a deep-in-debt theater director-producer named Oscar Jaffe who boards the Twentieth Century Limited train after the premature closing of his latest flop in Chicago bound for bankruptcy and ignominy in New York. On board, he and his aides de camp (played by the dependable comic sidekicks Michael McGrath and Mark Linn-Baker) hatch a plan for a comeback when they return to Manhattan in 16 hours. The centerpiece of their scheme: securing the signature of the lady in the suite next door, Lily Garland (Kristin Chenoweth), an Oscar-winning movie star whom Jaffe had discovered years ago but with whom he’d had an epic falling-out. 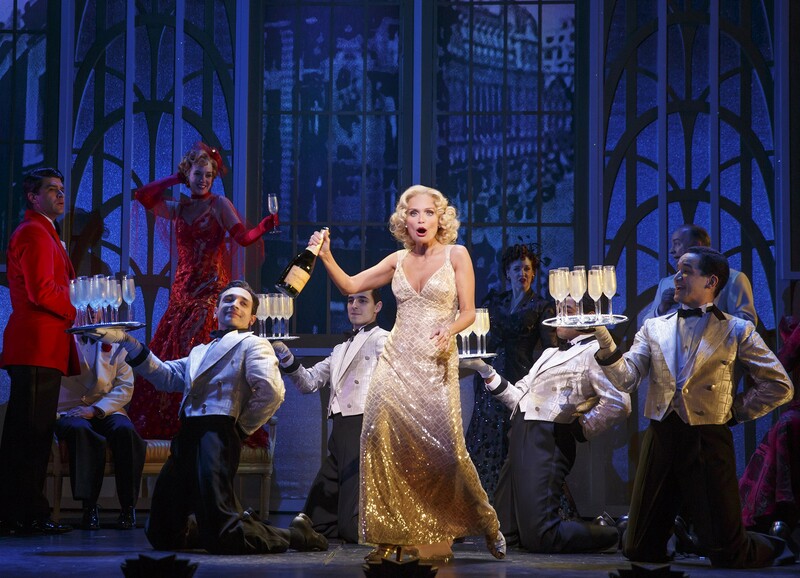 As Lily, Chenoweth deploys her operatic soprano and her full vamp diva routine, whether she’s posing for paparazzi or wrapping her palooka of a boyfriend (Rocky‘s Andy Karl) around her diminutive, jewel-bedecked fingers. She also gets some of the show’s best zingers, the handiwork of the incomparable lyricists and book-writers Betty Comden and Adolph Green. 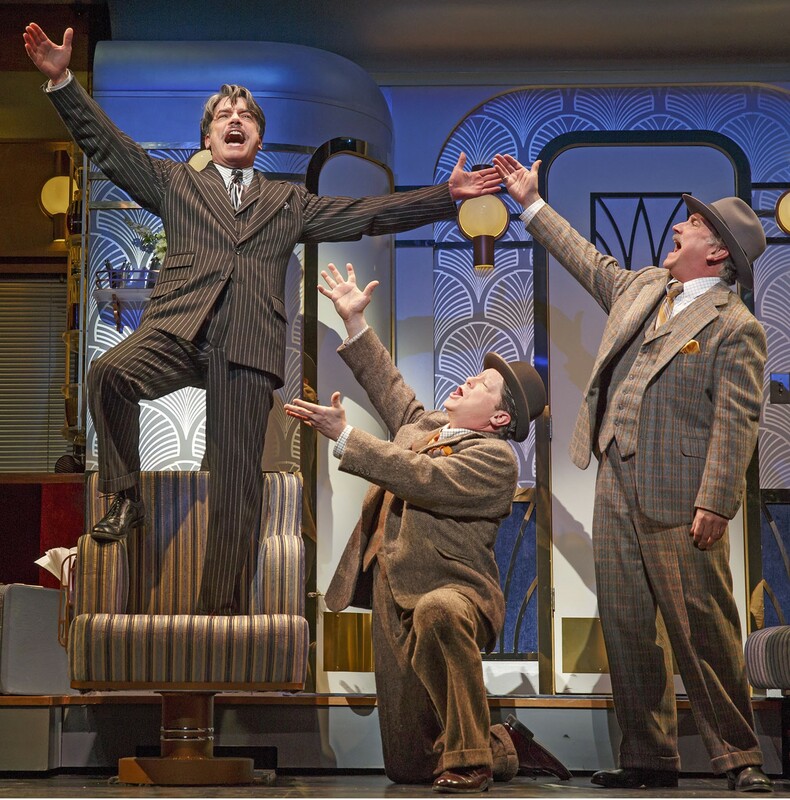 That dynamic duo are experiencing a comeback this season with their 1944 hit On the Town running just a few doors down on 42nd Street. While their work here foreshadows another ubiquitous Broadway trend — building a stage musical from a beloved movie, in this case the 1934 Howard Hawks film Twentieth Century — few contemporary wordsmiths could concoct rhymes as wittily wondrous as femme fatale/fleur-de-mal or Genie/Houdini. Coleman’s score, meanwhile, is a tuneful mashup of roaring-’20s zip and late-20th-century Broadway pizzazz — though there’s not really a breakout song in the mix.